Value-priced uniform nameplates ship within two production days! Thousands of choices - our badges are proudly made right here in the US! 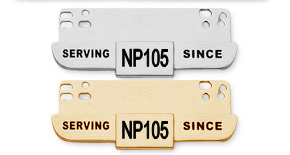 NP101 - 3/8" x 2 1/4"
NP100 - 1/2" x 2 3/8"
NP102 - 5/8" x 2 1/2"
NP104 - 3/4" x 3"
NP105 - Serving since hanger bar only available for model NP100 or NP102.